Preheat oven broiler. Snap tough ends off asparagus, then rinse and drain asparagus well. Place asparagus in a zip-top bag and drizzle evenly with oil. Seal bag tightly and shake gently to coat asparagus with oil. Place asparagus in a single layer in a 9″ x 13″ pan. Broil 5 inches from the heat source with the oven or broiler door cracked. After 2 minutes, pull the pan out and shake pan or use tongs to turn asparagus over. Return to the oven and broil 2–3 minutes more, or until crisp-tender. 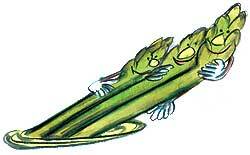 Watch closely and remove if asparagus begins to brown. Sprinkle lightly with salt and lemon zest, then divide into 4 equal servings. Serving size: 1/4 of the recipe.